Consistory. New cardinals’ profile show the Papal project for the Church. The 6th of January, Benedict XVI announced a consistory – to be held in February, 18th – during the one he will create 22 new cardinals. Four of these new cardinals will not take part to the next conclave, since they are already 80. 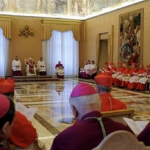 And good part of the new cardinals got the red hat because of their charge in the Roman Curia, and so the Curia will have a considerable impact in the next conclave. Despiting the various analysis (that always deal with numbers and “geography” of the next conclave), there is another way to understand what the next consistory will be meaning. And this way is particularly indicative of what is the approach that Benedict XVI aims the Church to take. Rumors about a new consistory had been circulating for long time. The last 5th of December, during a confidential meeting with some journalists, msgr. Rino Fisichella, president of the Pontifical Council for the Promotion of the New Evangelization, cracked a joke when he had to leave the meeting before of its conclusion. «I am awaited – he said – in the Apostolic Palace. It is not because of my next creation as a cardinal». The consistory question had already come into play, and lists of the possible new cardinals had already begum to circulate. Some of the most accredited insiders reported that there was a sort of bailouts for a red hat: or Fisichella made the cut, or msgr. Francesco Coccopalmerio, president of the Pontifical Council for Legislative Texts. It is during those days that someone secretly made pressures to move Coccopalmerio from the presidency of the Pontifical Council for Legislative Texts to the Apostolic Penitentiary. The head of Apostolic Penitentiary must be a cardinal, and so the promoted appointment could appear as a promotion. It was – on the contrary – a case of promoveatur ut amoveatur: Coccopalmerio’s move would have broken a post – the one as president of Pontifical Council for Legislative Text – that is considered a key-post for Curia’s balances. At the beginning of December, there had been other important events to remark. It is the 60th anniversary of the International Organization of Migration, and Holy See marked the anniversary its way, becoming a a full member of the organization, and not just as a permanent observator (this status the Holy See keeps on at United Nations, Unesco, Fao, European Parliament). The I.O.M. was established in 1951, and bases its activities on the principle that humane and orderly migration benefits both migrants and society. It has 130 member States, and around 100 observers. In his address for the application by the Holy See for membership of the I.O.M., msgr. Silvano Tomasi – Holy See Permanent Observer at the U.N. office in Geneva – noticed that «the experience of Catholic agencies and association in Geneva and on the ground worldwide, for example the International Catholic Migration Commission and the many national Caritas organizations, is well established and extensive». And he concluded: «The participation of the Holy See as a Member of the I.O.M. is a commitment to collaboration and support in the common search of solutions and assistance to people caught up in this mayor phenomenon of our globalized world». By becoming a full member of the I.O.M., Holy See increased its diplomatic impact. The decisions is a message sent to the ones who try to undermine Holy See diplomacy from the inside. Rumors from diplomatic environments said that there is the intention to let some lay take important charges in Vatican Diplomatic Corps. Pontifical Legates must be priests, because they represent the Pope. This rule is valid only for Papal nuncios. Papal nuncios are the Pope’s ambassador, but at the same time they work as bishops. They weigh up candidates for episcopate in the countries in which they are nuncios, they speak to Episcopal conferences, and they also have relationships with governments. On the other hand, nuncios who are appointed as permanent observer just have in charge to maintain relationships among Holy See and States. Appointing lay people as permanent observers would not be out of Canon Law. It is a subtle attack, moved from the inside, and it is also made through the requests made by advisors of European Union to enroll the Holy See in the «White List», the list of states most active in preventing and fighting the financial crimes. On December 16th, the message for the World Day of Peace is presented in the Holy See Press Office. An insider of the Vatican Secretary of State defined the text a «more or less a high school homework». It is certain that the message does not follow the sketch outlined from the Pontifical Council for Justice and Peace, and this is fairly understood during the press conference: card. Peter Turkson and mons. Mario Toso – number one and two of the Pontifical Council for Justice and peace – reveal the guidelines of international law and social doctrine of the Church that are just to be foreseen in the official text. It is the last part of a strain between the Pontifical Council for Justice and Peace and the Vatican Secretary of State – the climax of this strain was when the Pontifical Council published the document titled «Towards reforming the international financial and monetary system in the context of global public authority». During these days, the list of the to-be-created cardinals is definitely sketched out. The line is fair. Rino Fisichella will not be a cardinal, and the note of the Congregation for Doctrine of the Faith on the year of faith – released on January, 7th, but announced on January, 5th – is interpreted as a sort of diminishment of Fisichella, even if he has the important charge to manage the Synod for the Promotion of the New Evangelization, that will open the Year of Faith. On the other hand, Francesco Coccopalmerio is created cardinal. But there is not promoveatur ut amoveatur for him: he keeps his post at the Pontifical Council for the Legislative Texts. Why Coccopalmerio made the cut? The roots cause can be seen in a speech held by Benedict XVI in 2008. The Pope spoke to participants in the Study Congress organized by the Pontifical Council for Legislative Texts, on the occasion of the 25th anniversary of the promulgation of the Code of Canon Law. He quoted Antonio Rosmini: «The human person is the essence of law». And he said: «The ius ecclesiae is not only a body of norms formulated by the Ecclesial Legislator for this special people who form the Church of Christ. It is, in the first place, the authoritative declaration on the part of the Ecclesial Legislator of the duties and rights that are based in the sacraments and are therefore born from the institution by Christ himself». On one hand, Benedict XVI goes on with the «turning back to God» project, announced and proclaimed during the last trip in Germany, that is intended to be completed with the year of Faith. On the other hand, Benedict XVI feels the need to look back to the law, both canon and international law. In fact, Benedict XVI – in the letter to the Catholics of Ireland – wrote that «the program of renewal proposed by the Second Vatican Council was sometimes misinterpreted and indeed, in the light of the profound social changes that were taking place, it was far from easy to know how best to implement it. In particular, there was a well-intentioned but misguided tendency to avoid penal approaches to canonically irregular situations». It was 2010. It is also in the direction of giving more importance to law that msgr. Antonio Maria Vegliò, president of the Pontifical Council for Migrants, gained the berretta rossa. A highly experienced diplomat, Vegliò also got a doctorate in canon law. His appointment did not surprised as much, because it fulfills Ratzinger’s requirements: since Holy See joined the International Organization of Migrants, a cardinal can increase the juridical impact of its diplomatic corp. The idea is to get back to the solidity of the international law, and at the same time to leave behind the fickleness of diplomacy. And right before the announcement of the Consistory, during the Mass of the Epiphany, Benedict XVI made an important Episcopal ordination: the one of Charles J. Brown, a non-diplomat – he served until now in the Congregation for the Doctrine of the Faith – recently appointed as Papal nuncio to Ireland, to «fix» the difficult situation the Church of Ireland is living after the clergy abuse scandal. The appointment of Brown is also a response to the choice of Irish government to close its embassy to the Holy See and to continue relations through an ambassador based in Dublin. Such a «calm and collected» response to Ireland – Thomas P. Melady, who served as U.S. ambassador to the Holy See during the administration of George H. W. Bush, said to Catholic News Service – thus reflects not only pastoral concern but also the «maturity of Vatican diplomacy». This maturity, Benedict XVI aims to enforce. 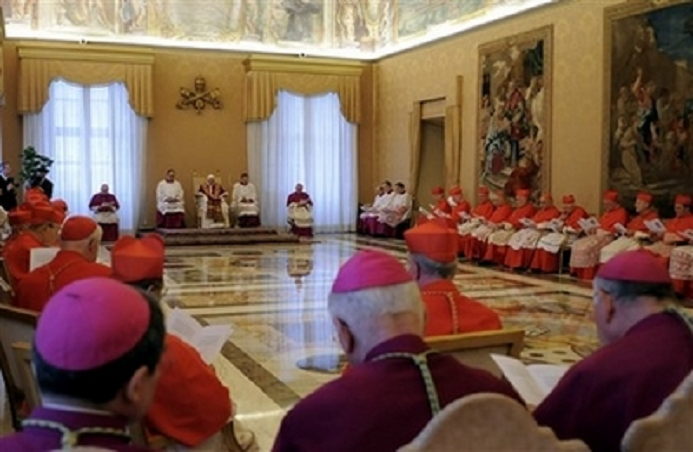 The list of the to-be-created cardinals increases the impact of Italian cardinals, and of Western Church in General, in the College of Cardinals. But, at the same time, the choices of Benedict XVI let understand what is his position: the Church needs to find its identity again, and its identity is also made of the ius ecclesiae. Turning back to law, to turn back to God: this is Benedict XVI project. 3 Responses to Consistory. New cardinals’ profile show the Papal project for the Church. I’m not positive where you’re getting your info, but good topic.